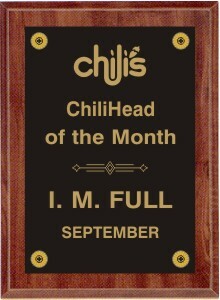 TO SYSTEMATICALLY CONGRATULATE & RECOGNIZE THE PEOPLE THAT MAKE IT HAPPEN! 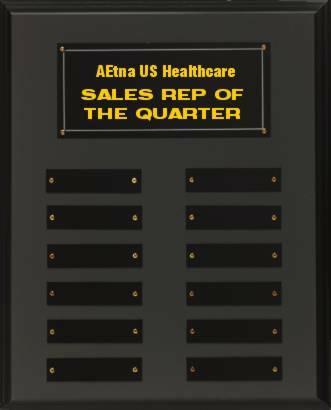 Choose a program below (C - O - N - G - R - A - T or S), determining whether you want a "Master" perpetual plaque to record monthly winners, an "Individual" plaque to present to the outstanding member of your team, or both! Click here to download order form - Adobe® Acrobat Reader required. 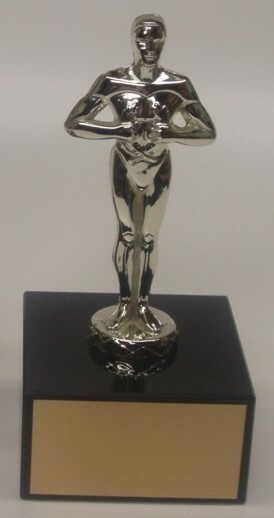 Send us the message to be engraved on the award(s). A company or club logo can be added at an additional charge - please call for quote. We maintain careful records of your program to ensure continuity. 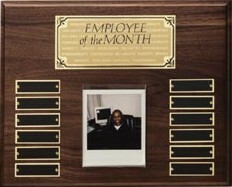 Receive your "Master" plaque in about a week, ready to display. Included with each program is a personalized form for easy ordering of the items in the program you have selected. We even include a screwdriver for attaching your monthly plates. 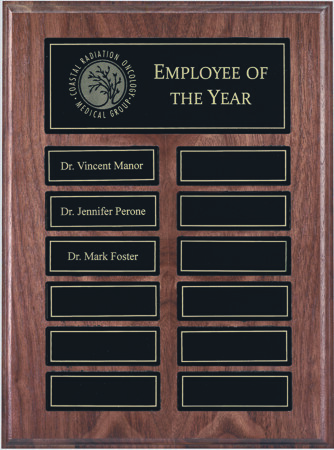 Each month, then, fax us the form with the winner's name and we will mail your plate and/or "Individual" Award within 4-5 work days. 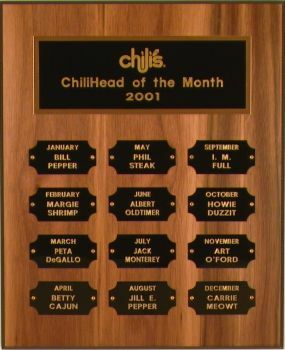 Mount the plate to the master plaque, present the award (for all to see), and congratulate the winner. N3 BEST VALUE! Order both N1 & N2 and save $43.00 for the year! 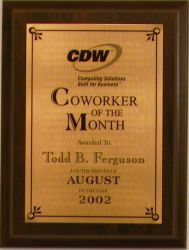 Click on plaque for larger image. 2009. *Upon request. we offer a special imprint on the N Program, where we do a subtle grayscale background imprint (via “sublimation”) with reversed-out lettering: "Service, Dedication, Initiative, Performance, Responsibility, Cooperation, Reliability, and Honesty"... or any words of your choosing. Come on, get out those POWER WORDS! 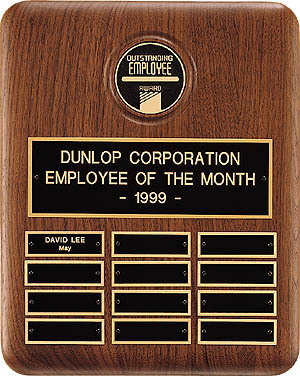 Click on plaque or trophies for larger image. 2009. Click here to view more Magna-Plaks. 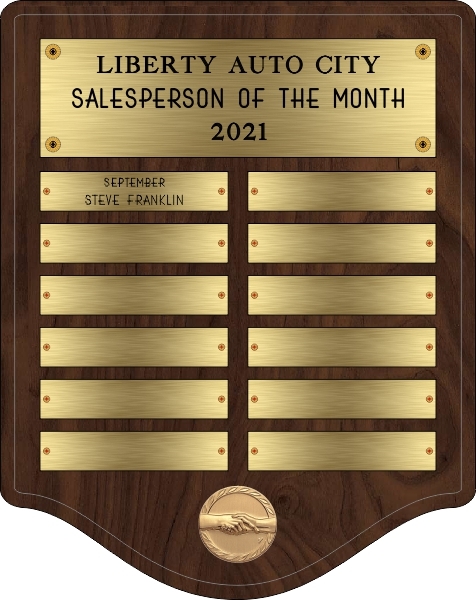 Click on plaque for larger image. 2015. 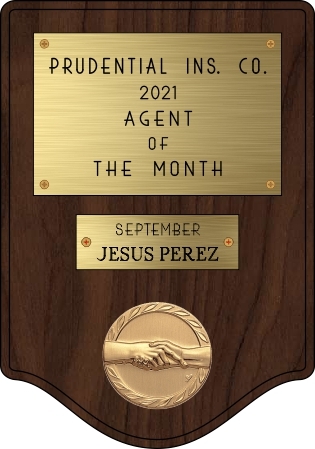 *Some standard "Activity Emblems" include "Handshake", "Employee of the Month", "Sales", Achievement, various sports,and more! Click here to view. 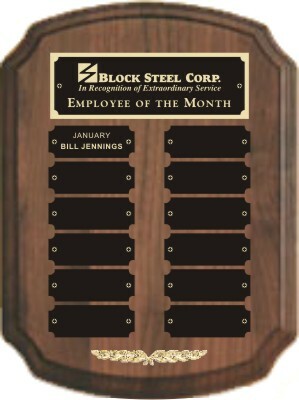 *Denotes in-stock plaque part of our Speedy Delivery Program. 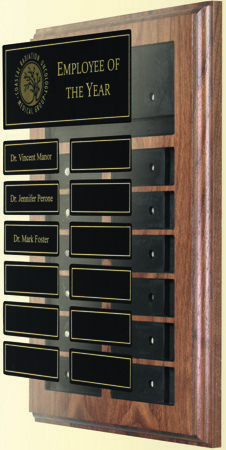 Click on plaque for larger image. 2009. 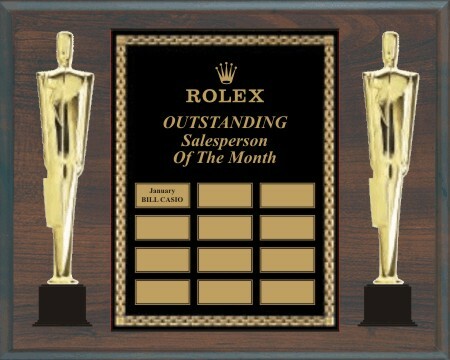 *A few popular "CAM" medallions include: Sales Achievement, Excellence, Outstanding Service, Employee of the Month, Top Producer, and many more! 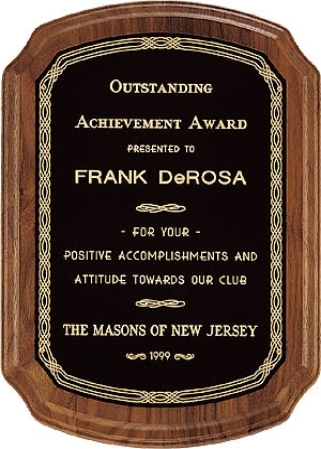 Click on plaque for larger image. 2009. 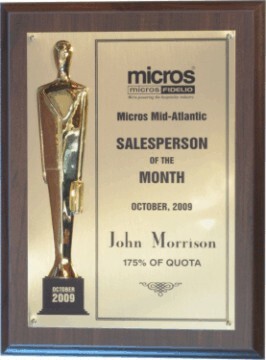 *Modern salesperson casting is not gender-specific... male and female castings available. 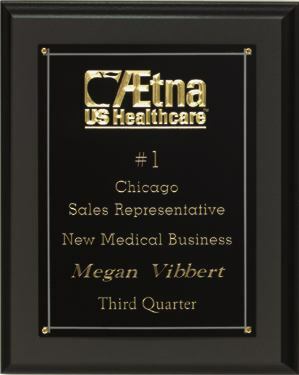 Prices do not include applicable Illinois sales tax or shipping charges for "Master" or "Individual" plaques. 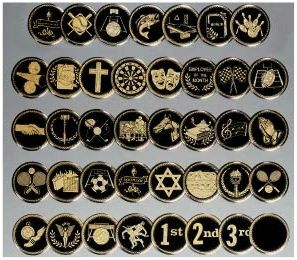 Additional letters of engraving (over designated amount) @18¢/letter. Click here to download order form - Adobe® Acrobat Reader required. 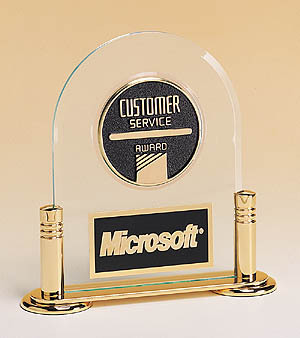 FOR PERSONAL SERVICE, YOU CAN CALL CLASSIC DESIGN AWARDS AT 847-470-0855.